I've always loved the way Bruce Springsteen's "Thunder Road" operates as a song and opening track to Born To Run, the way it sets the stage for a cinematic musical journey. "Bad Man's Blood" sets the scene for an unflinching story told with stark, minimalism. When the final notes of the album have faded, we realize the title track does for this album what "Thunder Road" did for Born To Run. This is a storyteller record floating on a current of folk and blues accoutrements that doesn't shy away from electric instruments that might turn off folk purists nor does it flamboyantly flaunt obvious echoes of Chicago, Memphis, or the Delta. It's a record with nothing to prove but a lot to say, and Bonneville does so masterfully. "Bad Man's Blood" is the kind of murder ballad Johnny Cash used to write and sing. Cash would sing of coldblooded killers and used violent imagery but in most cases there was a sense of regret or remorse. Even when that was absent, Cash's characters often accepted they'd receive a punishment that fit their crime. The man in "Bad Man's Blood" is crystal clear on his immediate but his explanation leaves a row of clouds above his conscience. He is mournful but is he penitent when he says, "I am bound for my fate, I've got a bad man's blood in my veins." "Darlin' (Put Your Suitcase Down)" is a plea for forgiveness and a desperate hope to hold on to a love heading for the door. Bonneville doesn't give us the full story but it's easy to envision a hard, gruff man being forced to confront his flaws and admit he's the reason she's about to leave and to think he's never been as emotionally naked as he is when he admits he's afraid of a future without her. Don't let the darker moments or the hushed, quiet nature of the record lead you astray. Bad Man's Blood is not all killers and hard times. "Good Times" has a breeze of melancholic nostalgia blowing through it but the heart of the song is about holding to good memories and "Funny 'Bout Love" has a gentle playfulness to it. Ray Bonneville has created a record that fits the bill of what was a crass marketing trick by the Chess brothers. 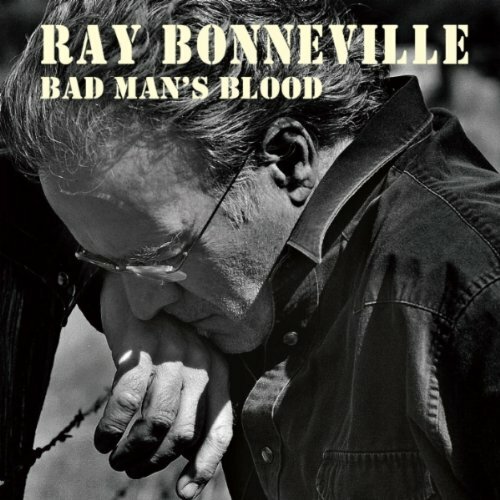 Bad Man's Blood is 'The Real Folk Blues' and one hell of a great album.